Kindergarten math games are a great way to practice math skills your kids are learning. By playing games, you’re giving your kids a hands-on and tactile way to master the math skills they’ll need each year in school. If you’re looking for a fun way for your kids to practice kindergarten math, then you need to find some math games! 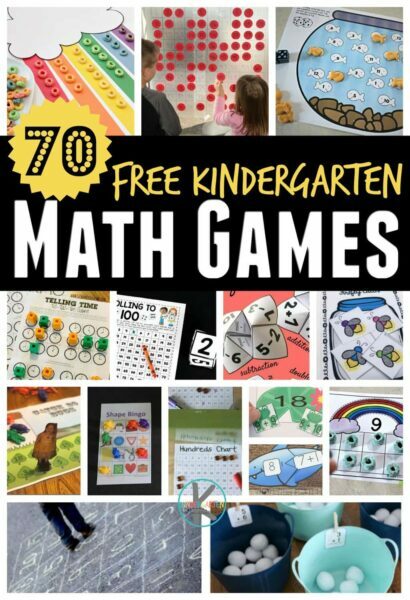 These 30 free printable kindergarten math games will help your kids practice basic math skills, such as counting and number recognition, as well as more advanced skills, such as addition and telling time. Get ready for some fun with these kindergarten math games! Counting and number recognition is one of the foundational math concepts that all children should learn in kindergarten. Without understanding numbers and their order, kids wouldn’t be able to move on to more difficult concepts, such as addition and subtraction. These fun math games will help you teach your kindergartner this foundational skill in a fun way! Counting Crayons Roll & Color Math Game – This roll & color game gives kids the chance to practice counting and number recognition. Plant a Number Line Math Game – Kids will love putting their flower numbers in order with this number line activity. Learning Numbers 1-10 – Kids will learn numbers 1-10 while sorting with this fun activity. Counting Game with Buttons and Muffin Cups – Kids will love counting buttons so that they match the amount in the bottom of the muffin cup. Apple Math for Kids – Here’s a fun apple-themed activity that helps kids with counting! Counting Caterpillar Busy Bag – What makes this counting activity even better is that it’s in a busy bag so that you can grab it for math practice on the road. Fruit Loops Ten Frame Counting Activity – kids will love practicing counting to 10 with these rainbow cards that use fruit loops! Math with a Rainbow Abacus – This rainbow abacus will help students count by 1s or 10s. Monster Memory Game – Students work on number recognition by matching numerals with words in this game. If You Give a Moose a Muffin Math Activity – Based on a story by Laura Numeroff, this counting activity helps kids understand more about numbers. Fine Motor Counting Activity – All you need are some leaves and clips for this number recognition activity. Gross Motor: Number Recognition Play – If the weather is nice, head outside and have fun practicing number recognition. Safari Count to 30 Game – what animals will you find on your Count to 30 Safari? Count to 100 Math Game – Students roll the dice as they work on counting to 100. Popsicle Stick Hundreds Chart – this unique activity helps kids visualize 100 in a whole new, and beautiful, way. Cup Challenge – kids will have fun counting and using engineering skills for this epic game! Driveway Counting Maze – I love that this fun counting game gets kids outside and moving! In kindergarten, kids begin to learn how to add and subtract numbers. 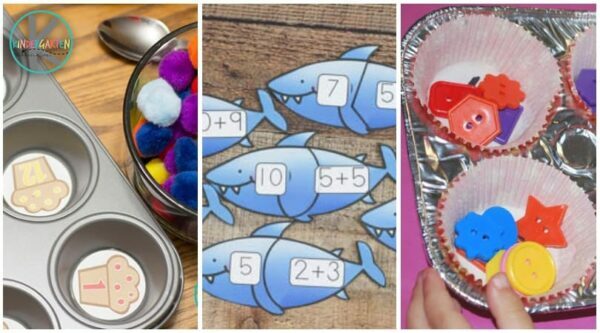 Since addition and subtraction can be a tricky concept for kids to understand, it’s important to use hands-on activities and games that give them a tactile way to learn. Once they’ve got the basics down, you can move on to teaching addition and subtraction equations, helping them solve even more math problems. Cupcake Math Activity – Cupcake liners and pom-poms make a fun way for kids to practice addition and subtraction. Shark Addition Puzzles – Kindergarteners will have a blast matching these shark-themed addition puzzles! Subtraction Bingo Math Game – If your kids need to practice subtraction, this bingo game is a fun way to do it. Playdough Snowball Addition – Rolling play-dough into tiny snowballs gives your kids a great manipulative to practice addition. Addition Tic Tac Toe Math Game – Tic tac toe has never been so fun! Combine this popular game and math using this activity. Rubber Duck Math Game – Introduce the concept of addition by finding different ways to make 10. Gingerbread Addition Puzzles – Who wouldn’t want to practice addition when you are adding up gumdrops! Rainbow Math Game – This addition math game can also be a tasty treat when the kids are done practicing! Pool Noodle Addition Math Game – Here’s a fun way to practice adding to 10… by using pool noodles! Candy Heart Addition Cards – who doesn’t like practicing addition with candy!! Fluency Within 10 Math Game – Once your kids have the basics for addition and subtraction down, play this math game to practice. Cootie Catchers Math Games – Pair up and have fun with addition and subtraction using this math game. There are many math skills a kindergartener needs to learn in addition to numbers and counting. Measurements, shapes and telling time should all be a part of your math curriculum in kindergarten. Kids should learn how to recognize shapes, start telling time and begin to take measurements so that they can compare objects. These foundational math skills will help kids as they learn new math concepts each year. Telling Time Matching Cards – These matching cards is great for practicing telling time to the hour, half hour and quarter hour. Hickory Dickory Dock Telling Time Game – Create your own clock for telling time with this activity. Snowman Telling Time Game – there are various free printables to make learning to tell time fun in this adorable pack! Telling Time Puzzles – are a fun independent game for practicing telling time. Roll & Cover Telling Time Games – Your kids will love rolling the dice to see what time they get! Telling Time Activity for Kids – Your kids can learn anywhere, including outdoors! Head outside for some telling time practice with this activity. Telling Time Clock Matching File Folder Game – This file folder game is a great way for kids to practice telling time. Measurement Hunt – Let your kids loose with a rule with this measurement hunt activity. Skip Counting Mazes – with lots of themes and increasing levels of difficulty, kindergartners will have fun practicing skip counting by 2s, 5s, and 10s. Shape Bingo – Can your kids recognize the shapes they need to know? Test their knowledge with a game of Bingo! Making Body Shapes – Kids will have a blast using their bodies to make different shapes. Spring Suduko Puzzles are a fun way for Kindergartners to practice logic and problem solving skills. Pizza Fraction Game – kids will have fun making their own pizzas as they practice fractions! Fruit Loop Color Matching – this fun color activity uses fruit loops or skittles! 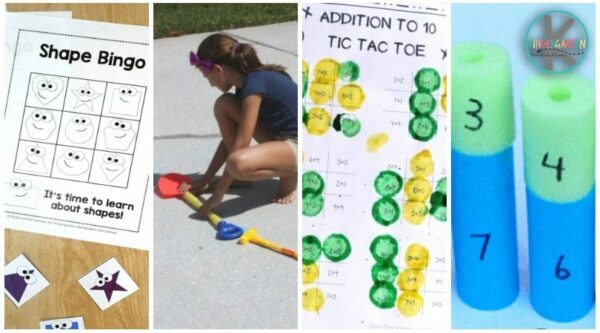 These fun activities and math games will make practicing kindergarten math fun and easy to master.